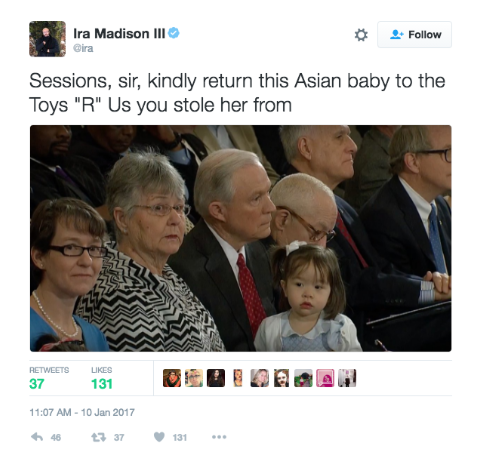 Madison accused Sessions of stealing his grandchildren from Toys “R” Us for the hearing. He went on to call his grandchildren a “prop,” brought to mitigate accusations of racism. Screen shot of Ira Madison’s tweet. His comments are not the first time journalists have mocked the minority grandchildren of white Republicans. An MSNBC panel led by former host Melissa Harris Perry derided former GOP Massachusetts Gov. Mitt Romney’s black grandchild on television in December 2013.